The Tanner was a barque, or three-masted ship whose foremast was square-rigged and whose main-and mizzenmasts were fore-and-aft rigged. She measured 156.38 feet long by 31.75 feet in breadth. She was built in 1863 by the Milwaukee shipbuilding firm Ellsworth & Davidson and was called Tanner because she was commissioned by several well-known Milwaukee tanners including Guido Pfister and Frederick Vogel. Panoramic view of Milwaukee from Lake Michigan, c. 1883. Great Lakes Marine Collection of the Milwaukee Public Library / Wisconsin Marine Historical Society. 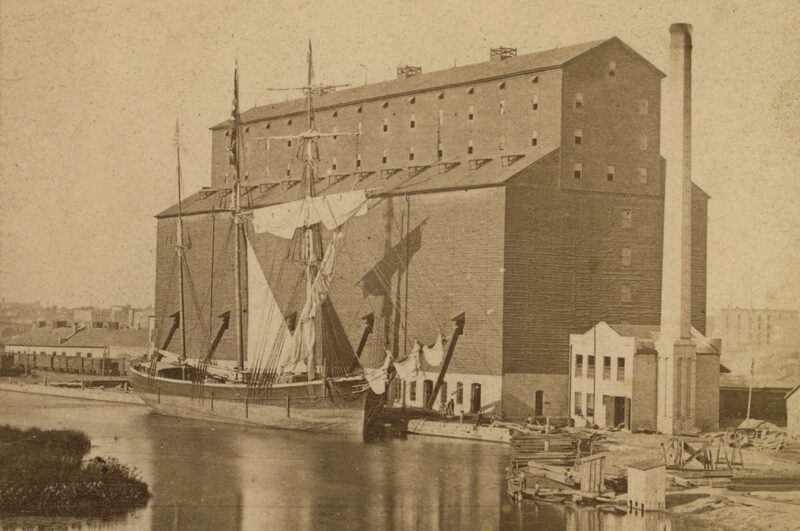 Bound for Buffalo with a full cargo of wheat, the Tanner left Chicago on the afternoon of September 9, 1875. Off of Milwaukee, she was struck by a powerful squall, which stripped away most of her sails and left her unable to maneuver. The Tanner dropped anchor in Milwaukee’s outer harbor. As a gale from the northeast followed the squall, the tug F.C. Maxon went to her aid. Three times the tug attempted to tow her to safety between the long piers forming the entrance to Milwaukee’s inner harbor. Three times the line parted. The tug was forced to retire, and the Tanneranchored again outside the harbor entrance. The gale increased through the night, slowly driving the stricken ship southeastward towards the remnant piers of the harbor’s original entrance. The Tanner struck them about 4 a.m., breaking her keel and immediately sinking to her deck in about 20 feet of water. Her captain, M. D. Howard, and his crew of nine scrambled into the rigging, where they clung for hours, battered by cold, rain, and fierce winds, as they watched their ship slowly break apart. At daybreak, the U.S. Revenue Cutter Andrew Johnson sent a rescue crew in its ship’s boat, but rough seas swamped the craft and ended the attempt. Shortly afterward, Captain Howard and the ship’s cook jumped from the Tanner’s rigging and began swimming for shore. The cook managed to reach shore near Bay View, but Howard drowned in the attempt. With large vessels unable to approach the shallows, the seas too rough for smaller boats, and the Tanner breaking apart, the situation had become desperate. Milwaukee’s inner harbor, composed of the navigable inland portions of the Kinnickinnic, Menominee and Milwaukee Rivers, provided good shelter from storms. This map shows the new, northern harbor entrance, built in 1855, along with the old harbor entrance to the south. Since 1855, entrance to the inner harbor was between two parallel piers, set 200 feet apart, extending into Lake Michigan. The night before the wreck, the Tanner dropped anchor outside the entrance piers (A). Through the night, winds from the northeast drove the stricken ship onto the remnant piers of the harbor’s old entrance (B), where she sank. Map of Milwaukee published by Chapman & Smith, 1869. Wisconsin Historical Society Image ID 989230. Experienced mariners looking on from shore then improvised a complex plan. They borrowed a flat-bottomed dump scow from the nearby Wolfe & Davidson shipyard and a lifeboat from the anchored steamer Amazon. About noon, the tug J.J. Hagerman towed both smaller vessels – now manned by six rescuers – upwind of the Tanner, then played out the line, allowing the boats to drift back towards the wreck. The scow acted as a breakwater, creating an area of relatively calm waters close to the Tanner. Tethered to the scow, the yawl ventured into the calmed waters. One by one the sailors jumped from the rigging, and the rescuers in the yawl picked them up and hauled them back to the scow. When all sailors and rescuers were safely aboard the scow, the J.J. Hagerman towed it back to shore. All six of the rescue boat volunteers received lifesaving medals of the second class from the U.S. Lifesaving Service. This account is derived from the following sources:Toronto Daily Globe, Saturday September 11, 1875. From http://images.maritimehistoryofthegreatlakes.ca/53205/data?n=15, accessed 9/11/2014. Milwaukee Sentinel, September 11, 1875. From http://www.baillod.com/wuaa/Milwaukee1.html, accessed 9/24/2014. Frank A. Flower, History of Milwaukee, Wisconsin: From Prehistoric Times to the Present Date(Chicago: Western Historical Company, 1881), 474-475. Annual Report of the Operations of the United States Lifesaving Service for the Fiscal Year Ending June 30, 1877 (Washington: Government Printing Office, 1877), 55-56.